If you read my blog regularly you will know I am a stay at home mum and that I also like to count this blog as my job. At current I don't make an awful lot of money from this little place on the net its still something I love to do and I put a lot of effort into. 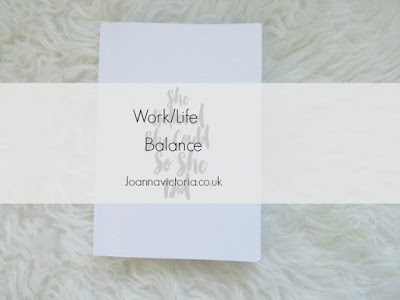 As I work from home with my blog I have to make sure that I have a good work/life balance as it's important I get work done but I'm also looking after Blake making sure we go out and do activities and then there is the chores that need doing. I have come across a fun quiz recently called will office life be the death of you? Which you can find here. It's a quiz that is just for a bit of fun and not take seriously. It says that I am stressed and need to have rest which in some cases is true. It's so important to have a schedule. That way I am more motivated to get things done and get less distracted. I have a planner which I only started using this year and I love it, its made me so much more organised and I know what posts need to be written, photos to be taken, when posts are going up etc. I also make sure I know what groups I'm going to with Blake so that I can schedule what I need to do around the home as well. I try and get housework done while Blake is awake as he is pretty good at entertaining himself. This way when it's his nap time I'm able to fire up my laptop and have about an hour or so to get some blog work done. When Blake is in bed I get a bit of blogging done if I have lots to do if not I use the time to relax do my own thing or spend time with the hubby. When doing housework I tend to put an alarm on my phone so that I only spend about 15-20 minutes of cleaning each room a day. to have fun. I make sure that we go out as a family or take Blake to classes or even do fun stuff at home and switch off from blogging. This is important as it stops me from having a burn out. I like to spend time on my own when Blake is in bed to just relax. during my me time I tend to watch something on netlfix, read a book or have a bath. Eating well and exercising is a must to make you feel lest stressed and better about yourself. Hi Joanna! I could use some of these tips, some days I feel like I am not being productive, while others I am running around like a maniac!